Danny, Sammy, Ed M., Ray, Boots, Perl, Art, Ed S.
Perl started the first UNION HIGH SCHOOL (Bremerton) band about 1924. Soon after, he established a dance band in the Charleston (now West Bremerton) American Legion Hall. He was so successful that the Legion tried to run the dances but were not as successful. Perl then built a hall up on Arsenal Way and became the best known hall in the area. The first hall was destroyed after a few years and he built a second one.. 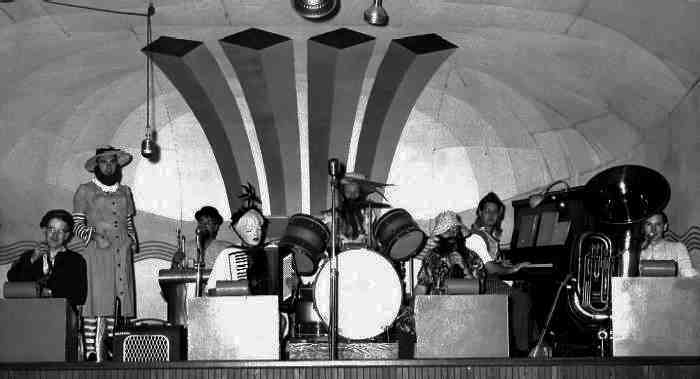 I think Perl may have continued to have dances and his own dance band into the '60s. In later years, perhaps to about 2000, Perl played drums and had a small combo in Belfair.